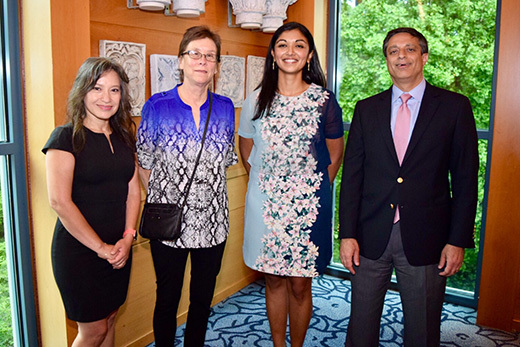 Nisha S. Joseph, MD, recipient of the inaugural Hanna Jean Khoury Special Fellowship in Leukemia and Transplantation, with Fellowship Program Director Martha Arellano, MD, Department Executive Vice Chair Amelia Langston, MD and Department Chair Sagar Lonial, MD. Winship Cancer Institute of Emory University has awarded the inaugural Hanna Jean Khoury Special Fellowship in Leukemia and Transplantation to Nisha S. Joseph, MD, a chief fellow in the Department of Hematology and Medical Oncology. Joseph graduated from the fellowship program on June 21, 2018. The award will allow her to complete an extra year of training in leukemia and stem cell transplantation. The fellowship was created to honor the memory of Winship leukemia expert Hanna Jean Khoury, MD, who passed away last year following treatment for cancer. The annual award will be given to a recent graduate who has already completed the hematology and oncology fellowship training program and is passionate about improving care for patients with hematological malignancies, including transplantation. "Jean was a leader and dedicated teacher who recognized and valued the need for additional training and mentorship beyond fellowship," says Sagar Lonial, MD, chair of the Department of Hematology and Medical Oncology and Winship's chief medical officer. "Creating the award was a special idea that Jean had for a long time. He would be excited to know that the award will help young fellowship graduates advance in the field of medicine." Martha Arellano, MD, director of the Hematology and Medical Oncology Fellowship Program, says: "As chief fellow in our fellowship program, Nisha has an early track record of leadership. Jean worked with Nisha during her first year of fellowship and was impressed with her dedication to excellence and her work ethic. She exemplifies professionalism, resilience, and a desire to heal."